Any man who has ever grown a beard will tell you the tricky part is learning how to manage facial hair properly. With some dedication, almost anyone can grow a scruff. However, managing facial foliage is a completely different story. Therefore, if you want to maintain a full beard, goatee and mustache, or any other desired facial hairstyle, then you’ll need to make use of a few grooming accessories. Most men who spot clean-shaven looks also make the mistake of thinking that a trimmer is all they need, which could not be further from the truth. Since it takes more than trimming to grow and manage a beard, for the best possible results, you’ll need an all-in-one grooming kit too. Some kits come with beard oil, balm or shampoo, and all of these products help to nourish, soften and condition beards. A complete grooming kit may offer several beard styling accessories such as clippers and scissors to maintain the desired facial hair length that you want. Other grooming kits include beard wax, which helps to tame unruly strands of hair or shape a mustache. Beard and mustache combs are the most common accessories for managing facial hair, helping ensure that your beard remains tangle-free. Some grooming kits also offer a soft bristle brush instead of a comb. Other brands add beard soap or bar to their kits, which can be very useful for daily beard care routines. Beard grooming kits are useful because they provide almost everything you’ll ever need to grow and maintain a well-kept beard. However, before buying a beard grooming kit, remember to take some time to shop around since there are so many different brands on the market and most packages don’t offer the exact same accessories. If you already have a few grooming basics like a trimmer and razor, then the Men Rock Beard Care and Mustache Care set will complete your manscaping arsenal. Items found in the kit include 100ml of beard soap, 30ml of beard oil, a 25ml tin of beard wax, one small bottle of beard wash, and a comb that can be used on the mustache or a full-grown mane. If you have no qualms about using scented beard care products, then this package is for you. The wax leaves a nice manly, Sandalwood fragrance scent while also combining well with the oak moss scented beard wash/shampoo that comes with the package. The best part about this grooming kit is that it comes neatly packed in a lovely gift box. If you choose to, you can get Men Rock to ship this kit with a personal note on the box cover that says, “For My Bearded Beloved”. This makes the Beard Care and Mustache Care grooming kit a perfect gift for a loved one. The only downside to this kit is the lack of beard length maintenance grooming essentials like clippers or a pair of scissors. Apart from that, the kit is very reliable since you’ll be getting other must-have accessories for managing a beard. 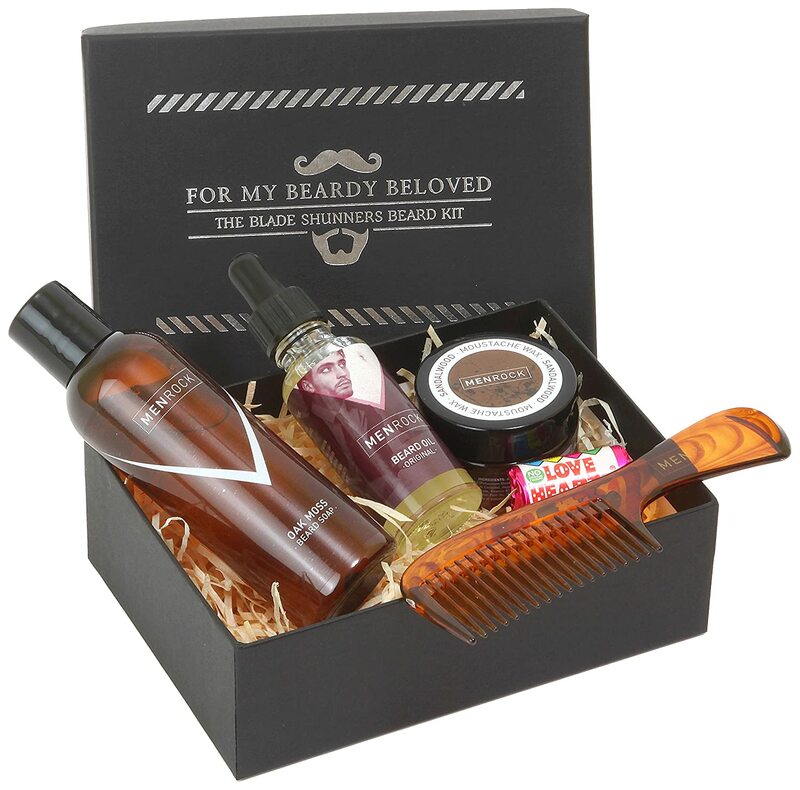 The Blade Shunner Beard kit from Men Rock also comes in a lovely gift box, which makes this kit ideal as a present. It’s perfect for women who want to offer something thoughtful to the men they care about. This particular beard grooming kit offers you beard soap, balm, and a comb, and the grooming essentials focus heavily on the beard growing process. As you probably know, the use of beard balm will nourish both skin and facial hair, and the oak moss scent found in the balm further adds a nice touch of manliness. The beard soap found in this package also comes with the same fragrance as its balm, so you don’t have to worry about using products with different fragrances that don’t complement each other. Another brand worth looking into when searching for a beard grooming kit is the package from Men’s Society. 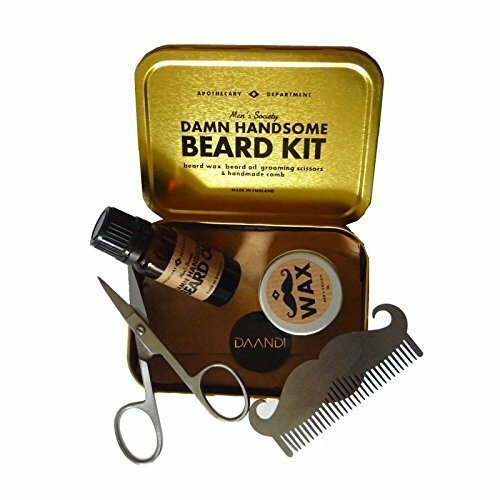 Among the many choices they offer, the Damn Handsome beard kit is one of the most complete all-in-one beard grooming sets you can hope to find on the market. For starters, the package includes a pair of scissors for trimming your beard, which works great for men who don’t want to accidentally nick off too much hair from their beards when using an electric trimmer. The comb in this set also has a stylish handle that takes the form of a mustache. 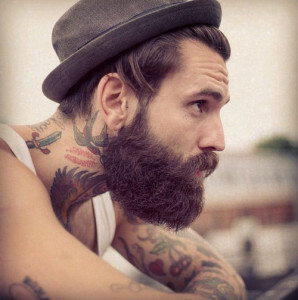 You can use it to untangle a full-on beard easily or hold some hair when clipping overgrown strands with the scissors. Finally, you’ll get a beard styling guide, some beard wax to shape your mustache or beard, and an all-natural beard oil to nourish those facial follicles. Everything comes neatly packed in a lovely gold tin, which measures only 11(L) x 8(W) x 2.5(H) cm in size. This compact design makes the Damn Handsome Beard kit perfect for men who like to travel with their grooming essentials. The Beard Envy Kit has several must-have grooming accessories that will help you to maintain a beard. This is a kit that’s perfect for men who sport a full beard. But while brushing is good for taming wild man fur, keep in mind that too much of it will create split ends. So, to avoid damaging the facial hair you’ve worked so hard to grow, make it a habit to only brush your beard just once or twice a day. 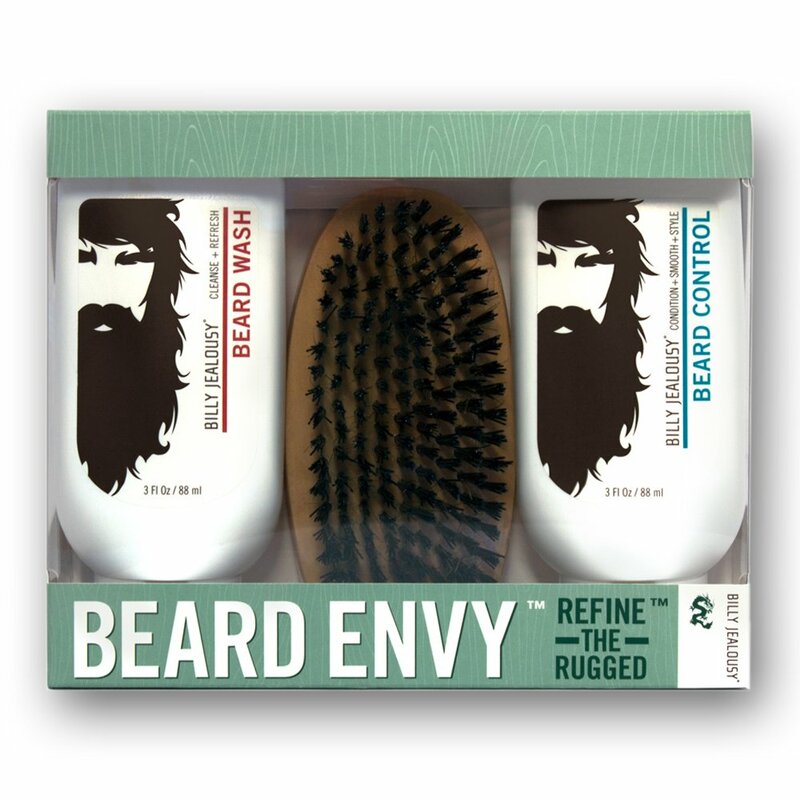 In addition to the boar bristle brush, the Beard Envy kit features a beard control lotion plus a beard wash enriched with Aloe and other conditioning ingredients. Using these accessories to clean facial hair will leave your beard nourished, soft, and with a natural hold. If you care deeply about your beard, then it makes sense to take care of it. Nothing could be worse than struggling through weeks of hell trying to grow a beard to your desired length, only to end up looking like an unruly caveman with a beard that smells as bad as it looks. If you’re not looking to chase women away with an unkempt appearance, then you should pick up one of the above-mentioned beard grooming kits so that you can give your beard the care it deserves.